Are you new to fishing and hoping to get the best experience ever? If you answered yes, then you will need a Spincast Reel. Spincast reel features a design that is meant to solve the problems that occur in spinning reels and bait spin casting reel to assure you of the best fishing experience. Hence, you can get them when you are in need of a fishing reel that is simple to use, one that will allow you to learn easily, and one that is easy to maintain. Now that you know why you need to get a Spincast Reel, how can you manage the right closed faced reel. I hope that this review will provide you with a great starting point. Keep reading so that you can determine if there is a reel that will meet your needs and desires. 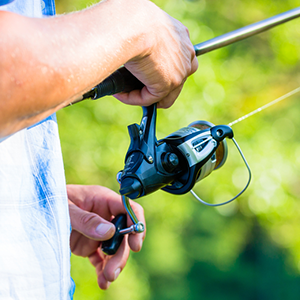 Get the power and precision that is needed when fishing with Pflueger Trion 10U Spinning Fishing Reel. The reel delivers the power and precision that is required while fishing to assure you of successful fishing experience. What’s more, it features a durable yet lightweight design. As a result, it serves as a great choice for anglers who are in need of a fishing reel that will last for long and one that is designed to offer reliable performance. You can get the fishing reel when looking for one that will deliver a smooth and consistent drag pressure due to the stainless steel and oiled felt drag system. Also, the reel is designed to deliver an excellent grip and a comfortable handling experience due to the soft-touch knob. The ten stainless steel ball bearings are another addition of the reel so that you can get an ultra-smooth operation for the best fishing experience. Enjoy a maximum performance at an affordable price once you get Abu Garcia BMAX3 fishing reel. It features a one-piece graphite frame and side plates to guarantee reliable performance. On top of that, the reel features a super strong machined aluminum spool with an ergonomic bent handle. As a result, you can get it when you are in need of a fishing reel that is designed to enhance strength and all-day comfort. Something else that makes this reel a great choice is its ability to boost your cast range and accuracy. The reason is the MagTrax brake system that exerts a consistent brake pressure. Also, the fishing reel features four stainless steel ball bearings to enhance a smooth performance for the best fishing experience. Next on the review is Zebco 808 Spincast Reel. The reel serves as a perfect choice for those who are in need of the best spin cast fishing reel for saltwater due to the stainless steel construction. Also, it features a lightweight design where it weighs 1.4pounds. As such, it serves as a perfect choice for those who are in need of a lightweight fishing reel. As one of the best Spincast fishing reels, you will appreciate this product due to the tough design that is meant to deliver reliable performance. More to that, the reel features a ball bearing drive. Because of this, you can get it when you are in need of a fishing reel that is meant to enhance smooth performance. Since the reel is pre-spooled with 25-pound monofilament, you can expect it to exert less strain on the knots to enhance reliable performance. A spin cast fishing reel that serves as a perfect choice for use in freshwater is Daiwa’s Silvercast-A Series Spincast Reel. The reel features a rigid aluminum alloy construction meant to guarantee durability. Also, it features three ball bearings so that you can be sure of smooth performance. The oversized line aperture is another addition of the reel meant to guarantee optimum performance. More to that, the reel adopts a smooth disc drag with a dial adjustment so that you can customize it to suit your needs. Featuring a lightweight graphite frame, you will love Zebco’s spin cast reel due to its ability to deliver reliable performance. Apart from that, the reel features a metal handle and rubber knobs meant to provide you with a secure grip. You can get the fishing reel when looking for one that is designed to enhance versatility due to the changeable right or left-hand retrieve. Also, the reel serves as a great choice for one that will deliver smooth performance since it has a 3.6:1 retrieve Ratio with a ball-bearing drive. Built using an ultra-smooth carbon matrix drag system, you will appreciate Abu Garcia Abumatic 170 Spincast reel’s ability to deliver the greatest amount of control. Apart from that, the reel features four ball bearings meant to deliver a smooth performance. Once you get this reel, you can be sure to save time and get onto the water faster since it comes when pre-spooled with Berkley Trilene XL. Also, the reel assures you of a long-lasting performance due to the aluminum diecast body and the Dura gear brass gear. When you are in need of fishing reel that will deliver a smooth and powerful performance, you can be sure that this reel will deliver that. One of the reasons to support this is the all-stainless steel 7-bearing system that delivers smooth performance. More to that, the reel features power & speed handles. These allow you to benefit from maximum leverage so that you can catch heavy fish. The fishing reel is built to last, thanks to the powerful brass worm gear and the die-cast aluminum body. Also, it is designed to enhance a fast line switching since it is equipped with a quick-change spool system. You can get the reel when looking for a versatile Spincast fishing reel since it is adaptable to right- or left-hand retrieve. Taking the second position in our best Spincast fishing reels review is Daiwa’s Goldcast Spincast Fishing Reel. The reel is designed to deliver a simple yet reliable performance so that you can get it for beginners as well as experienced anglers. One of the features that contribute to a reliable performance is the ball bearing drive. This enables it to deliver smooth and even retrieves to enhance a reliable performance. What’s more, the reel features an oscillating spool Levelwind. This enhances a consistent and tangle-free winding for easy setup. The reel is made using a rugged metal body and nose cone to guarantee durability. Also, it features an oversized line guide that is scientifically designed to enhance an optimum casting. Once you get it, you should never worry about set up since it comes while pre-wound with a premium line. The reel adopts a convertible right/left hand retrieve to enhance versatility. Another product from Zebco is Omega Pro Spincast Reel. It is made using a die-cast aluminum body and a stainless steel 7-bearing system to enhance durability and smooth operation. What’s more, the reel features a quick-change spool system with a free spare spool. This enhances a fast line switching for more convenience. You can get the reel when you are in need of one that is designed to deliver maximum leverage due to the power and speed handles. Also, the reel serves as a great choice when you are in need of a versatile Spincast fishing reel since it is adaptable to right- or left-hand retrieve. I hope that this review has been useful in helping you to determine the best Spincast fishing reel. I recommend these products due to the convenient design and affordable design. Therefore, avoid looking further when trying to find the appropriate fishing reel since these have the features that are meant to deliver convenience.